What is better than a 50% off sale of frames at Michael's? Having Michael's put the painting in the frame, complete with a wire hanger on the back for FREE! This will always be my way to go from now on....uh, er, well, expect for those situations when I complete the painting at 2:00 a.m. for an event the following day. My desire is to not work that way anymore, but, hey, who am I kidding....it probably will. Hopefully as I bloom, grow, mature, etc., etc., that will not be the way I work. Stepping out of the boat, preparing a variety of items to attempt to sell either by ebay, etsy, art festivals, local establishments. This morning I have completed my paypal account and linked it to ebay, etsy is next. There are several items in the house I plan to try to sell too. It is something that I need to do to help out around here. I'm excited about it. Still working on that other pencil drawing. Time is not always my own around here. Volleyball practice last night......brought it with me but with three teams practicing, the balls were flying and funny, I wasn't in the mood to be hit up the side of the head with one! Now, VolleyGirl has a sophomore class retreat that she leaves for tomorrow morning and stays overnight. This means packing..............rain, thunderstorms and possible severe (code for tornadoes!) are in the forecast so that doesn't make me feel so great about 5 buses of kids on the road! Apollo is in deep thought today, preparing for his post tomorrow. Yeah, I can see how potentially severe weather and 5 buses full of high schoolers would make you anxious. Definitely a little nerve wracking for the parents of said high-schoolers. First of all, love your hair. Next, yippee for Michael's. You can get some really great deals from them. If you give them your email address, they will clue you to some secret discounts, too. Your painting looks like a church bulliten cover. Third, I'm looking out for those storms, too. Always means power outages, at the very least. Hope your girls get there and back safely. And fourth, much good luck on your etsy, ebay sales. I know several people who do very well with ebay. They like to go to estate sales and find things to sell online. I know your artwork will do well, if that is what you are wanting to do. First of all, thank you for the note you left for me earlier. That was so sweet. Next, how different this angle makes you look. I wouldn't have known that this was the same person as your profile picture. I'm not sure how that is sounding....but anyway- nice hair! And I will be thinking of those kids on the buses, and hoping for cooperative weather. My girl is going off somewhere this weekend- presumably (sp?) by bus as well, to some kind of retreat. Last but not least, your painting looks good! I too, can appreciate a frame job by someone else! the new hairdo is fabadabadoo t. you look smashing! can see how collaging would be a tight squeeze for you, you are still so bound up with your kids and home, unlike me, kids all gone, hubby eats his man meal at work every day, so i have all the time in the world to please myself. Love your hair do. I used to have dark brown hair. It is now grey, almost white. 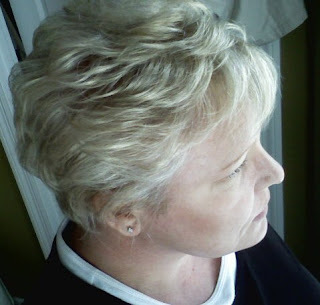 I have had young children describe my hair as blonde. Ha... far from blonde. I will look forward to Apollo's post tomorrow. Beautiful hair style for a beautiful woman; I hope your husband does not mind me telling you. Good luck with your promoting of your creations and I will try to help you in my own little way. You have talent and I am sure that you will be successful in marketing your creations. Great highlight job!! I ditched highlighting last year and went red after being blonde all of my life. The painting looks great! yay for Michaels! I used to sell on Ebay. You really have to watch the shipping charges. I ate so much in shipping fees, ugh. I love selling on Etsy although I mainly sell my cards. hey, please email me your address...I have something for you! PS: the painting and the frame, both are wonderful and I love the combination of the dark frame with the painting full of light and sunrays!